AS PEOPLE power in Syria threatens to topple autocratic leader President Assad, Israel is hoping that he stays in power. That's the anaylsis in an article by Edmund Sanders in the Los Angeles Times. He writes: "Syrian President Bashar Assad's race to tamp down public unrest is stirring anxiety in Israel that is even higher than its hand-wringing over Egypt's recent regime change. "Unlike Israel and Egypt, Israel and Syria have no peace agreement, and Syria, with a large arsenal of sophisticated weapons, is one of Israel's strongest enemies. "Though Israel has frequently criticized Assad for cozying up to Iran, arming Lebanon's Hezbollah movement and sheltering leaders of the Palestinian militant group Hamas, many in Israel think their country might be better off if Assad keeps the reins of power. "Several Israeli government and military officials declined to speak in depth about Assad, fearing any comments could backfire given the strong anti-Israel sentiments in the Arab world. "That's what happened when some Israeli officials attempted to bolster Egyptian President Hosni Mubarak before he resigned Feb. 11." Meanwhile, Assad has been claiming that conspiracies involving Israel and the USA are behind the insurrection. Protests countinue to mount and further bloodshed is predicted over the coming days as the President clings to power. CLASS War broke out on the streets of London on Saturday, as anarchists attacked banks, shops and other symbols of the parasitical neoliberal elite. A huge Black Bloc, at least 500 strong, roamed freely through the West End of the British capital, picking off targets at will with bricks, paintbombs and fireworks. Sporadic police attempts to stop the Bloc were met with robust resistance and cops were forced to retreat on more than one occasion. As riot cops belatedly caught up with the action, the Bloc made a timely re-entry into the main TUC march, where police were unwilling to follow. More attacks on banks, and the Ritz hotel, followed - to the general approval of the mainstream anti-cuts protesters. The successful day of high-profile action was only marred by the uninspiring behaviour of those sheep-like protesters who failed to express any anger at all at the neoliberal assault on their communities. Right-wing newspaper The Mail on Sunday reported: "Splinter groups broke off from the main body of more than 250,000 demonstrators marching from Victoria Embankment to Hyde Park to launch an assault on the capital’s main shopping district. 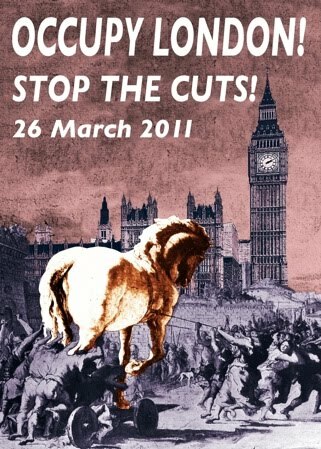 "Some were hellbent on storming – or destroying – any London landmarks synonymous with luxury or money. Others targeted companies associated with tax avoidance. 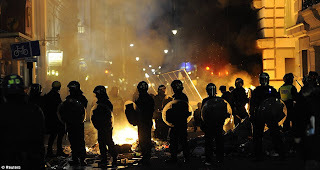 "Hundreds laid siege to The Ritz hotel, attacking it with paint and smokebombs. A Porsche showroom was also smashed up and upmarket department store Fortnum & Mason was occupied by about 1,000 activists. "On the streets outside, anarchists battled police. Some officers in Oxford Street were attacked with lightbulbs filled with ammonia, a sinister new weapon that can be assembled by following simple instructions on the internet. Other officers were hit with paint and flying bottles." ANTI-REGIME protesters in London, UK, are calling for a big turnout and radical action on Saturday March 26. A wide range of opposition groups are planning to take part in a day of dissent on the day of a big trade union march and rally. The neoliberal British state is, as usual, threatening police violence against anyone stepping outside the limits of what is considered 'authorised' forms of protest. THE SICK truth about the 'humanitarian' principles at the heart of the American-led neoliberal empire is set to be further exposed. Whle the US and allies try to seize the moral highground by aiding the anti-Gaddafi rebels in Libya, their image is falling apart elsewhere. Reports The Guardian: "Commanders in Afghanistan are bracing themselves for possible riots and public fury triggered by the publication of 'trophy' photographs of US soldiers posing with the dead bodies of defenceless Afghan civilians they killed. "Senior officials at Nato's International Security Assistance Force in Kabul have compared the pictures published by the German news weekly Der Spiegel to the images of US soldiers abusing prisoners in Abu Ghraib in Iraq which sparked waves of anti-US protests around the world. "They fear that the pictures could be even more damaging as they show the aftermath of the deliberate murders of Afghan civilians by a rogue US Stryker tank unit that operated in the southern province of Kandahar last year. "Some of the activities of the self-styled 'kill team' are already public, with 12 men currently on trial in Seattle for their role in the killing of three civilians. "Five of the soldiers are on trial for pre-meditated murder, after they staged killings to make it look like they were defending themselves from Taliban attacks. "Other charges include the mutilation of corpses, the possession of images of human casualties and drug abuse. 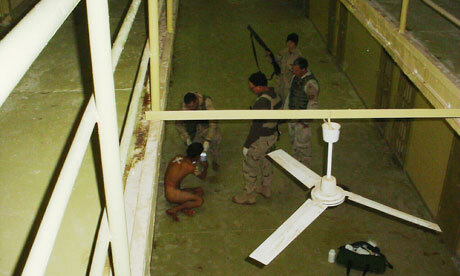 "All of the soldiers have denied the charges. They face the death penalty or life in prison if convicted. "The case has already created shock around the world, particularly with the revelations that the men cut 'trophies' from the bodies of the people they killed. 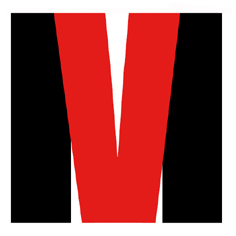 "An investigation by Der Spiegel has unearthed approximately 4,000 photos and videos taken by the men." FURY is expected to erupt in Pakistan on Friday March 18 in response to the outrageous release of US spy and murder suspect Raymond Davis. Protests have alrady been staged across the country, but Friday will also see a countrywide strike, as anti-American anger boils over. Reports the Express Tribune: "Like other parts of the country, the legal fraternity of twin cities on Thursday observed a black day against the release of US citizen and CIA contractor Raymond Davis and termed it 'an attack on Pakistan’s sovereignty'. 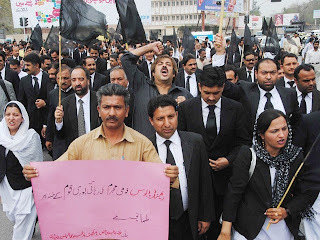 "Hundreds of lawyers assembled in Rawalpindi District courts to protest against the release of the Davis and later marched towards Katchery Chowk, blocking the road for an hour. "They chanted slogans against the government for providing safe passage to Davis, who was being tried for double murder and obtaining visa under a false name at the Lahore High Court (LHC). "In Islamabad, lawyers staged protests outside court premises and also took out rallies. Members of Lahore High Court (LHC), Rawalpindi Bar, District Bar Rawalpindi, Islamabad District Bar and Islamabad High Court (IHC) boycotted court proceeding and hoisted black flags on bar rooms." The US embassy and consulates will be closed on Friday in preparation for the angriest protests yet. NEOLIBERAL global forces are using the ongoing disaster in Japan as a cover for a brutal attack on protesters in Bahrain. Al Jazeera is reporting horrific scenes as anti-regime demonstrators at Pearl Roundabout in Manama are attacked by US-made Apache helicopters and foreign troops. Ambulances are being denied access to the wounded in what appears to be an all-out military assault on the unarmed rebels. Adds The Guardian: "Gunfire was widely heard throughout the capital and at least five helicopters were circling scenes of clashes, amid widespread panic on the streets below. 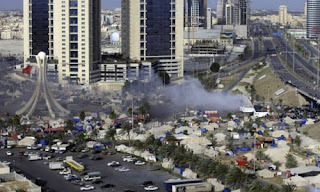 "This morning's events are a significant escalation in more than eight weeks of clashes that have threatened the legitimacy of Bahrain's monarchy and stoked sectarian tensions throughout the Gulf and Saudi Arabia. "They follow the arrival of more than 1,000 troops from the Gulf Cooperation Council (GCC), invited to the kingdom by its beseiged rulers. "One Amoured Personnel Carrier flying a flag of the United Arab Emirates was seen by bystanders this morning amid a column of troop carriers." The chances of any "humanitarian intervention" from the western allies of the oil-rich Gulf dictatorships are not thought to be high. CRACKDOWNS on protest merely postpone the day of reckoning – Arabs now have a shared, unstoppable drive for freedom. That's the message from blogger and journalist Brian Whitaker in an article on the Guardian website. He writes: "The fact that autocratic regimes in Libya, Bahrain and Yemen are fighting back with lethal force should surprise no one. "The more surprising thing is that Zine al-Abidine Ben Ali in Tunisia and Hosni Mubarak in Egypt – two leaders previously regarded as firmly entrenched – were toppled after such a short struggle. "Nor does the fightback mean that the outlook for democracy is dimming across much of the Middle East. Looking at the region as a whole, the prospects have never been brighter. 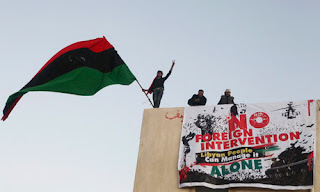 "Even if Gaddafi does succeed in quelling the Libyan uprising, it will be no more than a temporary setback for the wider Arab revolution: battles are being fought in too many places and on too many different fronts for anyone to stop it now. "An important factor in this is Arabs' sense of a common identity: they are aware of what is happening in neighbouring countries and draw inspiration from it with regard to their own situation. "The sight of grandees from the old regimes in Tunisia and Egypt being arrested on sundry charges of corruption, money laundering and murder gives them hope and encouragement. "Similarly, the opening up of free media in those countries is having an effect elsewhere: in Jordan last week, 600 journalists demonstrated against government interference and censorship. "This kind of cross-fertilisation (or infection, as the regimes see it) is happening in many areas. "Toppling two of the Middle East's tyrants in little more than two months is no mean achievement, and all the other regimes have been severely shaken – even those that claim to be secure. "Initially, that raised hopes extraordinarily high and the regimes' fightback has injected a dose of realism. It does not mean the revolution is failing or fizzling out but it does show that many people were expecting too much too soon. "The far-reaching changes that the Arab countries need are social as much as political – and that will take time. Even in Tunisia and Egypt there are protracted struggles ahead. "But the old regimes cannot survive indefinitely. A few years from now most of them will be gone or transformed beyond recognition." BAHRAINI police firing tear gas and rubber bullets clashed with demonstrators trying to occupy Manama's banking centre on Sunday, as protests spread to the strategic Gulf state's business hub, witnesses said. Reports AFP: "They said tear gas and rubber bullets were used against about 350 activists who had sealed off the capital's Financial Harbour business complex with road blocks and a human chain. "Hospital sources said around 200 people were hurt in the violence, mainly from inhaling tear gas. Three of those being treated were in critical condition, including one with severe head injuries." 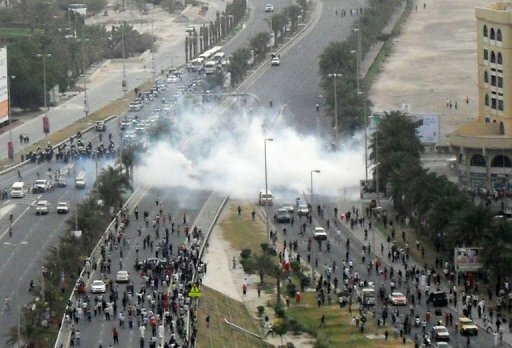 A video uploaded on Sunday to YouTube shows Bahraini riot police shooting an unarmed protester in the head at point-blank range with a tear gas round. The man is remonstrating with helmeted riot police when they shoot him twice from just metres (yards) away -- once in the body and, when he tries to get up, a second time in the face. The user who posted the 33-second "face-to-face shooting" clip says it was filmed during Sunday's unrest in Manama. It can be seen on http://www.youtube.com/watch?v=D9W_-0uGN1E&feature=youtu.be&skipcontrinter=1. 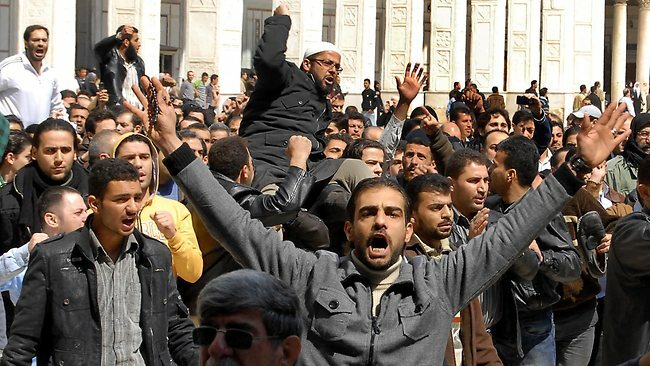 WHILE Libya's revolution has hit a stalemate, uprisings in other Arab states have been continuing. Protesters in Yemen are increasingly confident of a break-through as mass demonstrations break out all over the country. 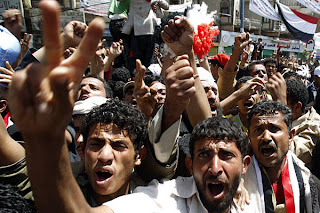 Reports The Financial Times: "Yemeni police opened fire on protesters in the capital Sana’a on Tuesday, wounding at least 65 people demonstrating for an end to President Ali Abdullah Saleh’s 32-year rule, witnesses said. "Demonstrations demanding Mr Saleh’s resignation took place in the capital and throughout the country, with thousands reported to have taken to the streets in the south-western province of Dhamar – the seat of some of the president’s key tribal allies. Tuesday’s was thought to be the largest protest yet in the area." And in Saudi Arabia opposition activists have called for a day of protest on Friday, March 11. Eman Al Nafjan, author of the Saudiwoman's Weblog, writes in The Guardian: "It's very difficult to predict what will happen on Friday. My guess is that there will be protests. "The larger protests will be in the eastern region and mostly by Shia Muslims. I also expect smaller protests in Riyadh and Jeddah. "What tactics the security forces use will greatly influence not only the demonstrators but also the people watching from their homes. "If undue violence is used against the demonstrators, it could possibly ignite the same fuse that led to full-blown revolutions in Tunisia, Egypt and Libya." REMARKABLE video footage has been posted online of Egyptian revolutionaries storming the Interior Ministry buildings in Cairo. Says a posting on the War in Iraq website: "Last night, the Revolution captured the USA Renditions Torture partner, Mubarak Egyptian State Security SS Head Quarters." It gives a link to a captured document showing plan to cause Moslem-Christian strife. It adds: "There are so many captured documents that we now have some thing called AmnDawla Leaks (SS leaks) at http://www.facebook.com/AmnDawlaLeaks." Adds the Wall Street Journal: "Thousands of protesters stormed buildings belonging to Egypt's internal security forces over the weekend, seizing what protesters described as a treasure trove of documents related to the regime of ousted President Hosni Mubarak. 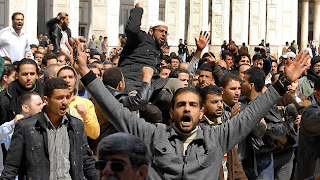 "Mobs of several thousand people broke in to three Interior Ministry buildings on Friday, Saturday and Sunday, including the Cairo headquarters for Amn al Dowla, the agency responsible for domestic security. Some of the buildings were set alight. "Protesters clashed with army troops on Sunday as they tried to enter a prominent Amn al Dowla building in downtown Cairo. Troops fired shots into the air to disperse the protesters." THE IRAQI people continue to mount a brave resistance to the regime imposed by the US occpuation. Although given little publicity by neoliberal media, their uprising has been given new impetus by the revolts across the Arab world. Reports antiwar.com: "At least six Iraqis were killed and 38 more were wounded in new violence. The worst attack occurred in the capital where a new agreement may allow journalists more freedoms. Also, the Arab League Summit has been postponed until May. "The United Nation’s Special Representative to Iraq Ad Melkert said the organization is concerned about human rights violations, particularly violence towards demonstrators and restrictions against journalists. 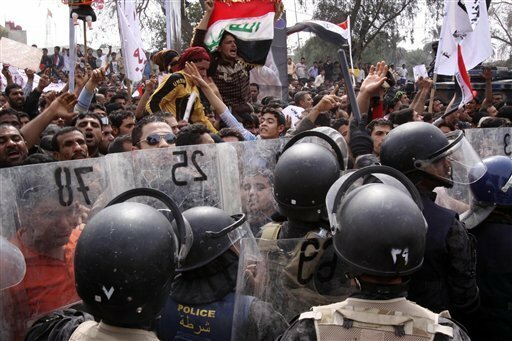 "Meanwhile, the Journalistic Freedoms Observatory and Baghdad Operations Command have reached an agreement to protect journalists during demonstrations and allow them to directly broadcast from protests. "In Baghdad, a pair of bombs targeting a Sunni Endowment official’s home in Ghazaliya killed one person and wounded 20, including the official. "A third explosion wounded two more. A blast targeting a petrol tanker in Rustamiya wounded one person. Two people were wounded when a bomb exploded near a fuel truck in Doura. "Three bystanders were wounded during an explosion on Palestine Street. Baladiyat saw three wounded after a blast. A blast targeting a U.S. convoy near the Mashtal Bridge left no casualties. "In Mosul, a blast at the home of a man who had worked as a translator for U.S. forces killed him. Gunmen killed a civilian yesterday. "A suicide bomber attacked a mosque’s imam after evening prayers in Ramadi. One civilian was killed and three others were wounded, including the imam. "One person was injured in an attack on a petrol tanker south of Baghdad. "A blast at the Tarmiya police station killed one prisoner and wounded three others. "Protesters in Baquba demanded the sacking of local officials and other reforms." LIBYAN revolutionary Muhammad min Libya has written on the Guardian website that Libya is united in popular revolution and the USA and its allies should not interfere. Despite all the violence and bloodshed, Libyans have high hopes. Gaddafi and Saif’s threats, he says, backfired as everyone across Libya went out to assert national unity. 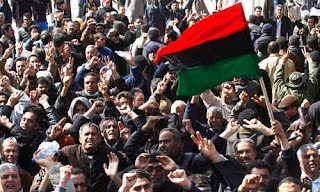 All Libyans feel it is only a matter of time before Gaddafi regime is gone. “This happy ending, however, is marred by a fear shared by all Libyans; that of a possible western military intervention to end the crisis,” he says. “So as the calls for foreign intervention grow, I’d like to send a message to western leaders: Obama, Cameron, Sarkozy. "This is a priceless opportunity that has fallen into your laps, it’s a chance for you to improve your image in the eyes of Arabs and Muslims. Don’t mess it up.